The first experiment -ochos in the stairwell at work. While this is an excellent time filler at lunch, it always seems that no one enters the stairwell until I'm in there - and usually it's my director taking the stairs. Slightly awkward, but workable. The next was the refrigerator at home. About the right width, obviously a bit on the tall side, but still workable for monitoring my stability for stretching, turning etc. The cat did not approve as he got a slight shove when he came (quite stealthily) to investigate what I was doing. There was much petting and cuddling the cat afterwards to repair his damage (-d ego.) Plus, I could still feel my axis getting wobbly but couldn't quite identify where in the turn or step I was losing it. Finally, I tried the oven/broiler combination against the opposite wall. This had two advantages over the refrigerator. First, the oven doors are mirrored allowing me to see exactly where my body is slipping in alignment. 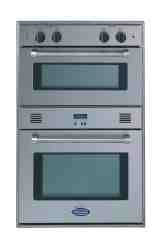 The second advantage is the horizontal line going across the top of the upper oven door. So not only can I see my wobble or tilt when it happens - but I can also see when and how far my head is dipping in relation to the line. Perfect. Also, I have to resist using the oven door as leverage as doing so tends to open the oven. This is not only slightly embarrassing but also attracts the above-mentioned assorted pets. So now I dance with my double oven.